29.04.2019, 09:16 через 3 Дней 8 Часов 29 мин. 50 сек. 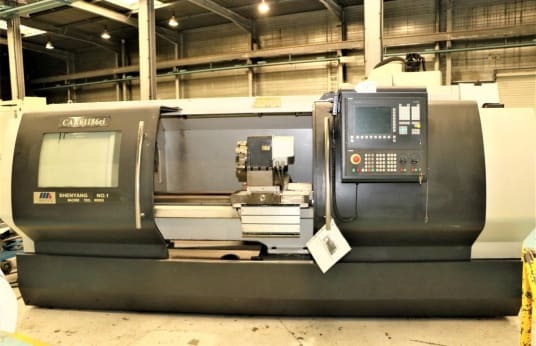 Numerically controlled lathe, Maximum diameter above the bench 610mm, Distance between points 1860mm, Maximum diameter above the transverse carriage 370mm, Bench width: 400mm - Spindle bore: 70mm - Number of speed ranges: 3 - Height of points: 305mm - Spindle speed: 40 to 1800 rpm - Longitudinal travel speed: 4m/min - Transverse movement speed: 6m/min - Tailstock sleeve diameter: 75mm - Tailstock sleeve stroke: 150mm - Tailstock cone: CM 5 - Numerical control: SIEMENS SINUMERIK - Turret indexing time: sec - Spindle nose: D8 1-8 - Spindle motor: 7.5kw, Stock number 96027. ATTENTION: Machine loaded by overhead crane.